Last Friday I went to see Jane to deliver some tatting shuttles and the next day she took me to a village in Gloucester called Churchdown, where we joined a group who had come together to tat. It was fun to be with others and spend the day tatting and nattering. A display of people's work was put on tables, there were some lovely tatted pieces to delight us all. I hope to join them next year if my big sister will take me again! Such variety. Beautiful and inspiring. I love miss mouse with her tatted edgings. Looks so fun! That lady withe parasol is gorgeous! ( as are other things)! What fun! I love getting together with other tatters. I always leave feeling inspired! Of COURSE I'll take you again. Next year there'll hopefully not be a road diversion which just simply said 'road closed'!!!! I hope in future they put diversion signs up for us to find our way round it!!! and I recognize some by my friend Linda, such lovely tatting, how nice to have a sister who tats. 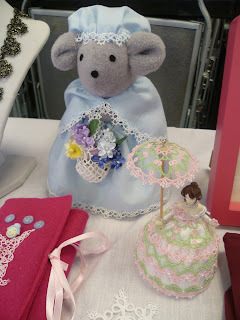 Totally in love with the gorgeous doll and parasol, and the sweet mouse and basket! Great ideas, and wonderful displays! So nice that you and Jane could get together! Lucky you ti have such a fab sister. 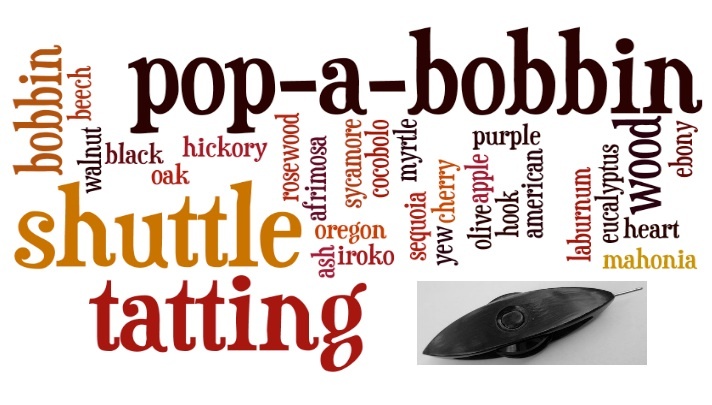 Love the mouse.